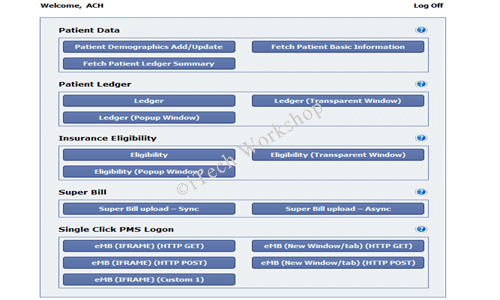 ﻿ EMR/EHR integration | iTech Workshop. iTech's secure & advanced expEDIum Medical Billing (eMB) is a complete Cloud based Practice Management and Medical Billing Software. This solution can integrate with Cloud/Web based EMR/EHR/Clinical Applications seamlessly and securely. This solution has already integrated with a few specialty EHR/EMR Solution and one such integrated solutions is the leading integrated EHR + PMS + Billing Solution in a State. Since iTech's focus is on providing an ideal and cost effective Medical Billing and Practice Management Solution in cloud, forming a strategic relationship with EHR/EMR vendors and providing them to deliver a complete seamlessly integrated EHR + PMS + Clearinghouse in a single solution provides with immense quality and value to the partnership. The expEDIum Medical Billing solution has secure web service interface available through which data can be exchanged between EMR & expEDIum using our proprietary XML in real time and also single "auto logon" from EHR to PMS can be done. Additionally, EMR/EHR can have their own UX/UI using RESTful APIs. iTech's expEDIum Medical Billing Software is available in SaaS (Software as a Service) model where we can white label the solution for EHR/EMR partners. This solution can be hosted in intranet or on internet. Request a demo of our seamless EMR integration module available for this product to check various touch points available.